Get Waisted is a powerful sculpting cream which helps you to tone, tighten and sculpt your waist. Promoting natural fat burning by increasing the energy within your skin, it helps to eliminate puffiness. Designed to improve the appearance and elasticity of the skin on your stomach, it will help it become more taught, smooth and firm. Tighten skin and smoothen cellulite with our bestselling range of firming serums. The Liquid Yoga range is scented with the soothing aromas of mint and lavender. Perfect for relaxing and unwinding after a long day! Keep your skin perfectly smooth and soft with our range of moisturising must haves. Treat yourself or a loved one with our range of Kits and Gifts! Step into the world of motherhood with the award-winning pregnancy skincare brand, mama mio. Add some power to your shower with our softening scrub, exhilarating shower gel and restorative bath soak. 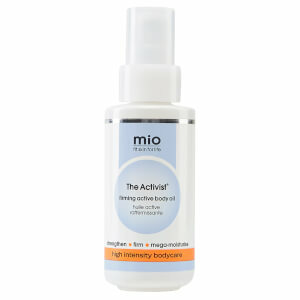 Founded and made in the USA, the mio mission is to give each and every wonderful woman fit skin for life. Mio believes in sisterhood and girl power, which is exactly why they've created this invigorating range to give women of the world skin that can easily cope with any challenges life may throw at them. Just as mio cares what goes in each product, they are equally obsessive about what stays out! That's why they have developed a no nasties promise to create the cleanest, most effective products possible.